In Genesis 3, the story of the fall of man is told. It’s the history of how the first man and woman broke God’s single, simple command and the curses that came to all creation because of their rebellion. It’s a story that takes place in a garden, involves a tree, and ends with people leaving a place they should have stayed. As a result of our first parents’ disobedience, shame and fear caused them to feebly attempt to hide their nakedness and hide from God. This original sin which we are all heirs to brought separation between humanity and God. In the aftermath, God gives both curses and blessings. The earth is cursed with thistles and thorns, making man’s work a struggle against the land. Man must now sweat for his bread. The man and all his kind will die and be buried, returning to the earth from which he was made. The woman will now suffer great pain in childbearing, and she will be under the stress of filling a role of submission with a heart-desire to rule over her husband. The man and woman must also leave the garden behind. The serpent was cursed too, but a promise of future blessing came with its curse. God said, “I will put enmity between you and the woman, and between your offspring and her offspring; he shall bruise your head, and you shall bruise his heel,” (Genesis 3:15, ESV). This is what Biblical scholars call the proto-evangelion, the first-gospel. Here, so close to the beginning, we are given the promise that a man would come, the offspring of a woman, who would destroy the serpent though he would also be struck himself. Throughout the Old Testament, the details about this promised one are sketched out in types, shadows, forerunners, and foretellings–individuals and events that pointed to the One who would overcome the power of sin and death. God blessed the man and woman he had created to bear His image by not destroying them outright as their sin deserved. They certainly died spiritually that day, but God mercifully spared their physical lives for it still pleased Him to work His good plan through them. God also clothed them; He made adequate coverings for their bodies from the skins of animals. Again this points to the way of things with God, blood was shed to cover man’s sin. And so we come to the celebration of Good Friday and Resurrection Sunday, or Easter as it’s popularly called. Jesus was a man born of, in earthly terms, only a woman; he was outside the line of inheritance for Adam’s sin yet still the offspring of woman. The ancient serpent Satan struck him a mighty blow, it seemed at first. In a garden, this man who was the “bread of life” sweat drops of blood in anguish as he struggled in prayer over the things only He knew were about to come. This son of woman willingly submitted himself to the hands of ungodly rulers to endure pain greater than childbirth. Jesus, blameless as He was, took a punishment he did not deserve and forgave those who tortured and killed Him. He wore a crown of thorns on His righteous head, thorns which grew from the ground He had cursed because of sin. His clothes were striped from him; much of his own skin was stripped from him, too. He was shamefully hung naked on a cross, on a tree re-shaped for one cruel purpose. He died on that tree, and his lifeless body was taken down and placed in a tomb. And in all this, he undid the curse. We began in a garden, and Jesus’ tomb was in another garden. A tomb is where a dead person is supposed to stay, but Jesus left His garden tomb behind. The great great turn around of history had begun. What looked like the end turned out to be a set up for a new beginning. Because of Jesus’ life, death, and resurrection, we who are naturally born sinful sons and daughters of Adam and Eve can be supernaturally reborn sons and daughters of God. Because Jesus overcame death and the grave, we can know that death is not our end but have hope for the coming resurrection to eternal life. Because Jesus lived as one of us and remained sinless, we can hope to sin less and less as we live by the same Holy Spirit that was in Him. Because Jesus bore our guilt and shame on the cross, we have no reason to hide in fear from God, instead we can run to Him as our loving Father who has been anticipating our return. The cross of Christ undoes the fall of man for all who will have it and all its glorious ramifications. This is what Easter Sunday is about. This is what every Sunday is about. This is what every moment of every day is supposed to be about. Is this what you are about? Let’s be about sharing this message until He comes again. This is my new Bible. It’s, as you can see, a Chronological Life Application Study Bible in the New Living Translation. 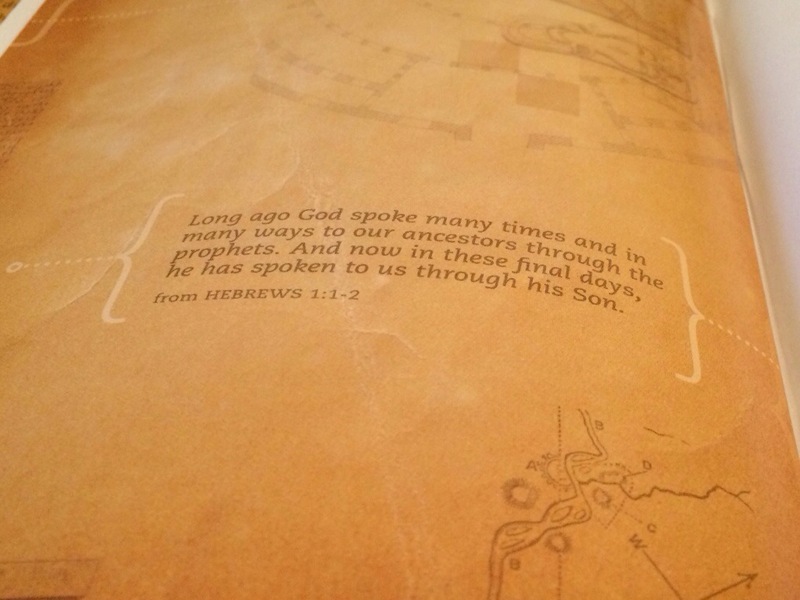 For a while now, I’ve read through a different translation of the Bible each year. It wasn’t all that intentional at first, but I’m on a pretty good streak. (Of years, I mean. Day to day, it’s rare that I string more than a week together without something derailing at least one day’s extended reading time.) Sometimes, I’ve chosen to simply read book by book through a regular version of the Bible. The rest of the time has been spent working through various study Bibles, reading every last note and article along the way. I’ve gone through The McArthur Study Bible in the NASB translation, The Holman Illustrated Study Bible in–obviously–the HCSB (scathing review pending), The Daily Bible in the old NIV, as well as at least one round through the old NIV, and twice through the ESV. It’s not complicated. Reading 3 chapters a day carries you through the whole Bible in a year. Typically, you can read only 15 minutes a day and be on track to finish in a year. Reading a study Bible with all it’s notes and such will mean that you either spend more time reading or cover less ground each day of course. I typically read complete “episodes,” which is to say I’m looking for natural breaks in the narrative as places to stop. Sometimes that’s hard, but most of the Bible really is in story form. There are also more reading plans out there than you can shake a hardback KJV at. In fact, many Bibles have one or more reading plans mapped out in some of their supplemental materials. 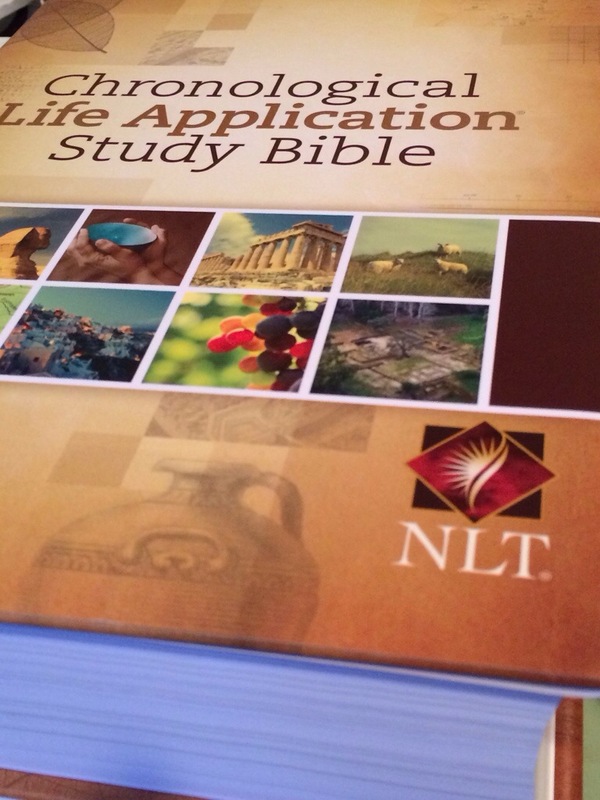 This year, the Bible of choice is the previously mentioned and pictured Chronological Life Application Study Bible in the NLT. I went Chronological because I found the format very helpful at connecting concurrent events across various books the last time I read a chronologically ordered Bible some years ago. I went Life Application Study Bible because I wanted a study Bible that was less scholar-directed and more average-Joe oriented. So far, it’s been good for my soul to see some simple truths highlighted and applied to everyday life, even my everyday life. I went New Living Translation because I wanted read the whole New Living Translation. That’s supposed to sound obvious. I like the NLT in general. If you are looking to do in depth Bible Study, then it’s not the way to go because it is very interpretive and fluid in the translation philosophy. However, that’s precisely what makes it so easy to read, and that readability is what makes it such a popular translation. So because I know some of my people will be using it, I want to have experienced all of it as well. Besides that, I enjoy the flavor of many of the translation choices, for lack of a better way to put it. I’m not posting any of this to say “Hey, look at how awesome I am at reading my Bible.” I am trying to encourage you that Bible reading isn’t that hard and is super rewarding. You can’t deeply understand any one part of the Bible if you don’t have a basic familiarity with the whole thing. That’s not to say you can’t be a Christian until you’ve read the Bible, but what kind of Christian are you if you’ve never read the whole story of the Christ? Do you not want to know this God you claim to worship? Too many “Christians” are like the people Moses led out of Egypt who when confronted with the power and glory of God revealing Himself on the mountain said, basically, “You go hear from God, then come back and tell us about it.” (It’s in Exodus, which you know if you are a Bible reader.) Those people died in the wilderness because they didn’t really know and trust God, and that’s my fear for a person who calls him/herself a Christian but refuses to take up the discipline of Bible reading. “Pastor, you go hear from God, and then come back and tell me about it.” Are you asking someone to tell you about the light rather than opening your eyes? Hopefully that last paragraph wasn’t for you. I read the Bible because I love the Bible because the Bible tells me about God because He loves us and wants us to know and love Him. God wrote a book. Have you read it? Why would anyone ever stop? This is a test. This is only a test. If successful, this post will verify that Paul E. Caspers’s blog is syndicated through NetworkedBlogs.com which also posts automatically to Twitter, @pecaspers, which then gets forwarded to his Facebook timeline. If this had been an actual post, there would have been something interesting here. There is not. Something went wrong in my neck back in June 2013, which manifested itself as pain that began in my shoulder but had developed into pain/numbness/tingling down my entire right arm–from shoulder to fingers–by September. It was getting better through chiropractic care, until some unknown action caused a full blown herniation of one of the discs in my neck in late October or early November. That left me in constant pain–bearable if still, severe if trying to do much of anything, and excruciating if I made a wrong move. And like so, I switched to a general practitioner who got me on pain meds and referred me to a neurosurgeon. I gave at-home-traction a try, but ultimately ended up getting a vertebral fusion. I’ve been in recovery mode for seven weeks as of today. Sadly, that means that I’m probably not going to get much better than I am, which is bad because I’m not great. Hopefully, the neurosurgeon will have good news when I go back to see him on Monday. As it stands, two of my fingers and the back of my forearm are still partly numb, my incision site still feels funny (forgive the technical terminology), I get tired easily, and it often feels like someone is pressing a hot rock into my back but not in a good way. Your ongoing prayers are appreciated. This was part of a different post, but it ruined the line of thought to keep it there. Chances are good that I’ll be mining these last couple months for all sorts of thoughtful gold, and that’s why wanted to go ahead and post this without any additional commentary. There is this thing called the Internet; maybe you have heard of it. It’s kind of like newspaper, radio, television, video games, shopping malls, bars, and old-time country back porches all rolled into one. On the Internet, there are all sorts of places to post your thoughts. As November began, I started seeing many of my friends, far and near, post things they are thankful for. If you are on the Internet, then you probably noticed this too. In fact, I’m also doing this, but I’m a few days behind at the moment. Anyway, it got me thinking. Who are all these people thankful to? All the people posting their thanksgivings on various social media platforms aren’t Christians. Likewise, not everyone who will gather with friends and family around a roast turkey (or a deep fried one or a block of tofurkey or whatever) in celebration of our American Thanksgiving holiday is a Christian. Some seem to be thankful to a vague notion of God which isn’t true to His character, and others seem to be thankful to the impersonal universe in general. You can’t really give thanks to a God you don’t know. I know that when I say I’m thankful for something general–like my church or clean tap water–I mean that I am thankful toward the one true and living God who has revealed Himself through history as recorded in the Bible and through the person and work of Jesus Christ. That God is the one to whom all my thanksgiving is ultimately directed. What about you? Who are your thanks toward? Do you know the God who made you? Do you know His steadfast love that He put on display by covering for all you faults, failures, and faithlessness through His sacrificial death on a cross? Many people are guilty of receiving God’s good gifts and turning to something or someone else to say thank you. Or, perhaps worse, they’re not giving thanks at all. For my part, I’d like to thank you for taking a moment with me to consider how we ought to give thanks for “Every good gift and every perfect gift…from above, coming down from the Father of lights with whom there is no variation or shadow due to change,” (James 1:17). Let’s praise God for who He is. Let’s thank God for what He’s done. And as often as we have opportunity, let’s point people to salvation by grace through faith in Jesus Christ so that they may join us in thanksgiving to the glory of God. I am thirty-three years old today. I have two beautiful children. I live in a quirky, little house. I drive a car that is in great condition, though currently it needs a wash and oil change. I have have four part-time/occasional jobs that don’t keep all the bills paid. I have a generous father and father-in-law who cover what my plural jobs don’t. I have a ministry serving outside my primary calling in a position I am not gifted for with a church I don’t fit though I love the people dearly. I have about a dozen versions of my résumé to show for a search for a church to pastor which has stretched on for over a year and a half. I have a heavy burden for the spiritual growth of the students in my youth group. I have a pain in my shoulder that has improved with chiropractic care but shows little sign of going away completely. I have a growing endurance for distance running though I haven’t run in over a week because I’m waiting to see if what I think is heat rash goes away. I have a rash, but you know that now. I have a shrinking waistline. I have a bank balance that is holding steady for the first time in a long time. I have an old phone, but it’s still an iPhone and gets the job done. I have no idea why I’m typing this on my phone instead of on my laptop. I have a great selection of graphic t-shirts. I have a desire to accomplish many things in the next 33 years of my life. I have a valid passport in desperate need of some stamps. I have a number of books in need of reading and some in need of rereading. I have a Savior, God, and King who is in control of all that seems so chaotic. I have a hope in heaven secure. I have a full cup of coffee. I have a lot for which to be thankful. Here’s to the next 33 years, perhaps even the next 66! It is late-September. Do you know what that means? It means that Christmas is right around the corner. That’s right; I went there. You can argue that I’m jumping the gun here, but the fact is that most retailers have their Halloween stuff out already and will be putting Thanksgiving and Christmas decorations out in the coming weeks. Our church choir has already begun preparing for our Christmas cantata. Our LibertyYouth Christmas activities have been on my mind for over a month. We are less than 100 days away from the holiday that is the climax of “the most wonderful time of the year,” as the song goes. Ready or not, here Christmas comes. As stores and churches make long-range preparations for the coming holiday season, I want to challenge you to go ahead and plan to prepare your heart. Ask yourself now whether your past Christmases have been mostly about how the eternal God took on flesh and lived among us, or if they’ve been focused on all the materialistic trappings and traditions with only a tip of a furry red hat to the baby in the manger. Will the biggest gift you give be to yourself, your kids, your spouse, or to your church as the body of the Christ we celebrate? Will you hustle and bustle to get the deals and buy presents and decide that you are too busy to be present among God’s people when they gather to worship Him? I’m not trying to lay a guilt trip on you. I’m trying to give you a heads up so you can make plans that speak clearly about your priorities. What treasures will most consume your Christmastime? Will they be laid up under a tree or laying at Jesus feet? When you set your mind on things above, will that be higher than the reindeer paws up on the housetop?